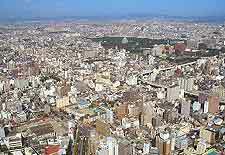 The fourth-biggest city in the country and famous for its coastal position, alongside the Pacific Ocean, Nagoya is located on the island of Honshu, in the Chubu area. 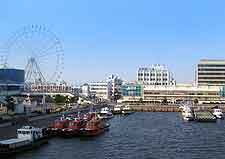 Part of the Aichi Prefecture, Nagoya is an important industrial city and whilst it may not immediately stand out as a desirable tourist destination, Nagoya does contain many decent tourist attractions, amidst its gleaming high-rise buildings and spacious boulevards. Nagoya's transport system is excellent and covers the area with ease, often making the city almost feel town-like. With a grand castle, museums, traditional Japanese gardens and an endless selection of restaurants, Nagoya has never been more attractive to tourists. Located in the central concourse area of Nagoya Station, a visit to the main Nagoya Tourist Information Centre (TIC) can prove invaluable, with smaller tourism bureaus also available at Kanayama Station and within the Oasis 21 building, on the southern side of the city centre. English-language maps and city information is readily available at all of these tourist offices, together with handy 'Best of Nayoga' tourism brochures. 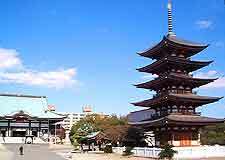 A major tourist destination is all respects, Nagoya has many attractions to fill your day. When visiting, look out for the Higashiyama Zoo and Botanical Gardens - the biggest zoo in the whole of Asia, complete with observation tower, fairground rides and beautifully landscaped gardens; the Japan Monkey Park - popular with all the family and known for its fascinating information about chimpanzees; the Noritake Factory - producing huge quantities of chinaware and porcelain, where visitors can observe the ceramic-making process; and also the Port of Nagoya Public Aquarium - a huge attraction full of marine creatures from all over the world, complete with a superb penguin enclosure and IMAX theatre. 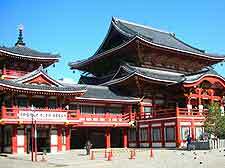 More information about Nagoya Tourist Attractions. The cityscape of Nagoya is a true mix of old and new, with many historical buildings of great importance, alongside towering modern edifices. Particularly important is Nagoya Castle - the city's number one landmark, dating to the beginning of the 17th century and referred to locally as 'Nagoya-jo'; the Nagoya TV Tower - dominating the skyline and boasting superb views across much of the city; Inuyama Castle - the oldest central castle in the whole of Japan, overlooking the Kiso Ontake and Ena mountains; the Nittaiji Temple - famous for being the site where the remains of Buddha Shakyamuni were discovered; and the stunning Osu Kannon Temple - sited within the centre of Nagoya and featuring traditional bright red Japanese architecture at its best. More information about Nagoya Landmarks. Museums in the city of Nagoya are full of information about the city's past, industries and anthropology, while the city's art galleries are home to an impressive selection of international paintings. Many excellent exhibitions await at the city's top museum attractions, which include the Kakamigahara Aerospace Museum, the Little World Museum of Man, the Toyota Automobile Museum, the Nagoya City Museum, the Tokugawa Art Museum and also the renowned Nagoya City Art Museum, where visiting artists from the Ise Bay area and beyond display their works. More information about Nagoya Museums and Nagoya Art Galleries. 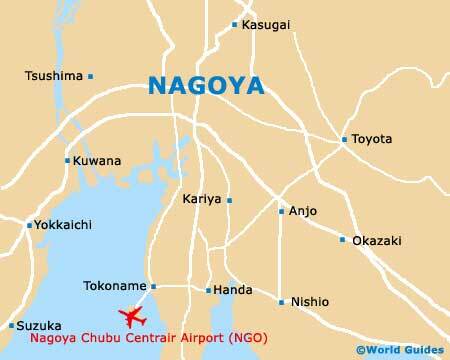 Close to Nagoya you will find many nearby tourist destinations and huge cities, which you should allow time to visit. With truly unmissable attractions, nearby Kyoto and Osaka are two of Japan's most popular cities and home to ancient Buddhist temples, historic shrines, Japanese gardens and world-class restaurants. 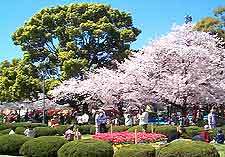 Also near to Nagoya and worth a look, the city of Gifu is famous for its Shoho-ji temple and Buddha statue, while Hikone city may be considerably smaller, but still full of interest, with the 17th-century Hikone-jo castle being a firm favourite with visitors. 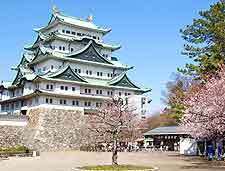 More information about Nagoya Attractions Nearby.